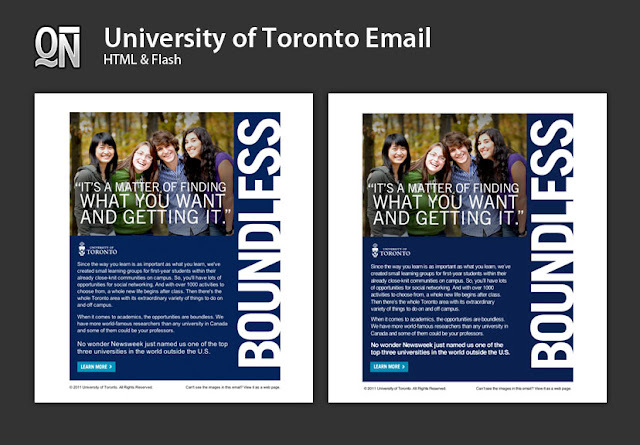 Simple email campaign for the University of Toronto. I was looking up universities before I received this project and UofT is ranked as one of the top Universities in the world. Pretty cool it's just in our back yard but for me it might as well be across the world. I hate travelling to the downtown core. It's mainly why I try to avoid working for any ad agencies because of the wasted travel time to get there. With all the buzz that's going on from multiple TED talks on the subject. I hope to see more distance learning and e-learning in their curriculum in the near future.